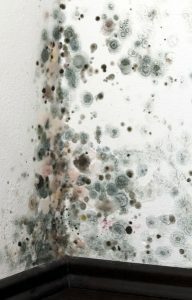 What Is Black Mold and Why Is It Such a Problem? All molds are a type of microfungus that eats away at other materials. The majority of them aren’t harmful to people, although they are unpleasant to look at and can gnaw away at building material. Stopping mold is one of the main reasons you want experts to handle water damage restoration: the quicker the professional can remove the water in the material, the less chance of allowing mold to develop. Black mold (Stachybotrys chartarum) is a harmful mold that rarely grows in the wild. It prefers to feed off cellulose material found in homes, and water damage gives it the perfect opportunity to develop and spread. The mold gives off spores that are harmful to breathe, especially for infants or the elderly. Black mold spores can cause a number of respiratory problems, leading to coughing and wheezing, eye irritation, headaches, chronic fatigue, and skin rashes. Prolonged exposure becomes even more harmful, causing nausea, vomiting, and even lung bleeding. Something important to know about water damage restoration: it must meet specific codes, and this applies to homes and especially businesses. This is one of the many reasons you have to rely on professionals. The restoration not only takes care of damaged building surfaces, but also electrical systems, the HVAC system, and the plumbing. You can trust our team to handle any water damage to your home or business. We use the best in technology, and our team members have IICRC (Institute of Inspection Cleaning and Restoration Certification). We’ll handle all parts of the process, including testing, disinfecting, personal belonging recovery, and temporary power. At Sweetwater Plumbing, we don’t charge by the hour—we charge by the job! Call us any time, we’re always open for business.